The Old Cobargo Convent is centrally located on the Sapphire Coast with short drives to Tilba and Bermagui. The historic village of Cobargo with its unique shops, antiques, leather shop, wood gallery, broom maker, pottery is all in walking distance. 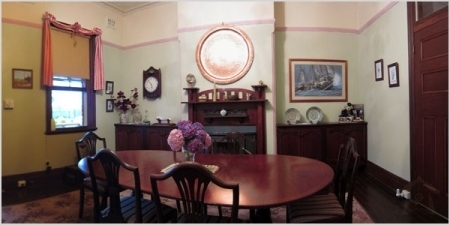 Built in 1917 our heritage listed B&B is restored and furnished with antiques. Feel like you have stepped back in time with high ceilings and French doors lead onto the verandah, where you can soak up the country atmosphere enjoy the space and breathtaking views across the valley. 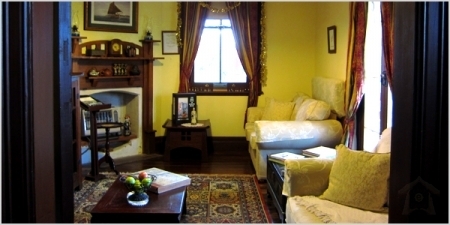 Bed & Breakfast at the Convent, or fully self-contained accommodation at the Old Cobargo School House in the grounds. Our sumptuous breakfasts keep our guests returning to stay. Bed and breakfast accommodation - choose from three bedrooms each tastefully decorated. The Twin Room Formerly the nun’s chapel but is now a comfortable bedroom. This room is air conditioned with a private bathroom and 2 single beds which convert into a luxurious king size bed. The Pink Room This was the nun’s bedroom. It overlooks the church with its beautiful stained glass windows. Private entry via French Doors. It is furnished French provincial style and has a Queen size bed with Air Conditioning and Ensuite. The Blue Room Originally the boarder's dormitory. Decorated in Laura Ashley style. Has queen size bed and single sofa bed with Ensuite. With French doors providing access to the verandah overlooking the scenic valley. Dining Room Do you love the smell of fresh baked bread in the morning served with home made jams, yogurt made daily with fresh fruit salad to delight your taste buds? From the wicker chairs on the verandah, feel like your miles from routine, yet only walking distance from Cobargo. Surrounded by State forest and the occasional farm house, cows grazing on the hillside with rolling misty mountains in the foreground. The only hint of the houses past, is the sound of the near by church bells. We have been collectors for many years and have filled the house with our love of period pieces but with the comfort of modern needs. Each room has its own ensuite, the blue room is spacious with a queen bed and a single which overlooks the valley. The pink room has a queen bed and a single bed with views to the church with the beautiful stained glass windows. The twin bedroom can convert to a king size bed with a private bathroom. All rooms have heating and electric blankets. 50% deposit required on packages prior to booking. Major Credit Cards Accepted Visa - MasterCard - BankCard.